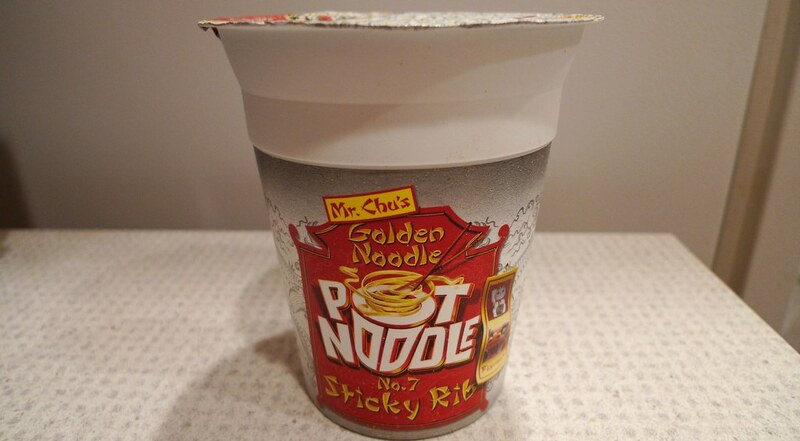 Golden Wonder Pot Noodle - Mr. Chu's Golden Noodle No. 7 Sticky Rib. I present to you the longest title for an instant noodle product ever! Alright, so I don't really have any proof of that, but you do have to admit that it's pretty ridiculous. 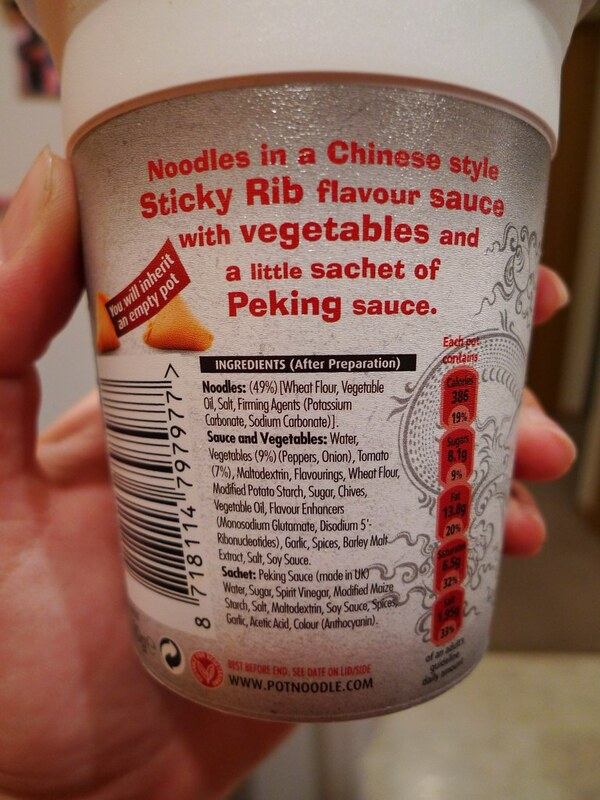 Sticky Rib Pot Noodle is my second noodle product sent over to me by a good friend I have over in England. They aren't exactly known for their food, so will Sticky Rib stick with me? Find out after the jump. 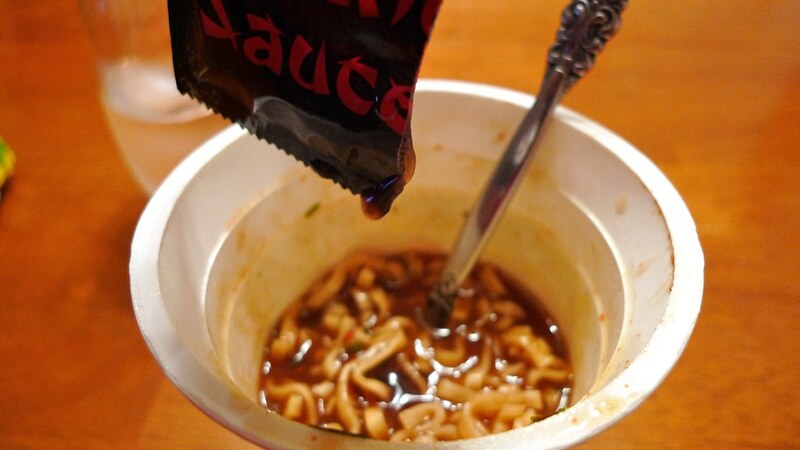 Unlike most Pot Noodle packages, No. 7 Sticky Rib is a little more flashy. It has Asian font, bright red colors, and a dragon. I think this fictional Mr. Chu is supposed to be Chinese, but there is also a picture of a Maneki Neko on it. Chances are, you've seen Maneki Neko before. It's also known as Welcoming Cat, Lucky Cat, Money cat, or Fortune Cat. Some people call it Chinese Lucky Cat, but they are WRONG! Wrong! You hear me!? That's wrong! Gotta love that British humor (humour). Ahem, sorry about that folks. Getting back to the review, Sticky Rib's flavor is based on Chinese Spare Ribs. My grandmother used to make this often and she still does! 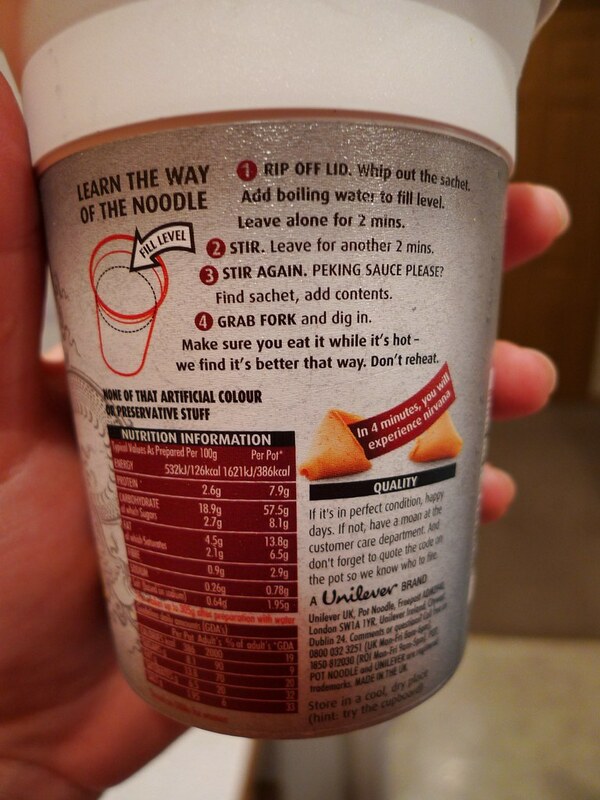 I wasn't sure if a pot noodle was going to be able to capture this unique taste, but I had to give it a try. What Mr. Chu's Golden Noodle No. 7 looks like. Like the last pot noodle I tried, Chip Shop Curry, this one comes with the dry seasoning already mixed in with the noodles. 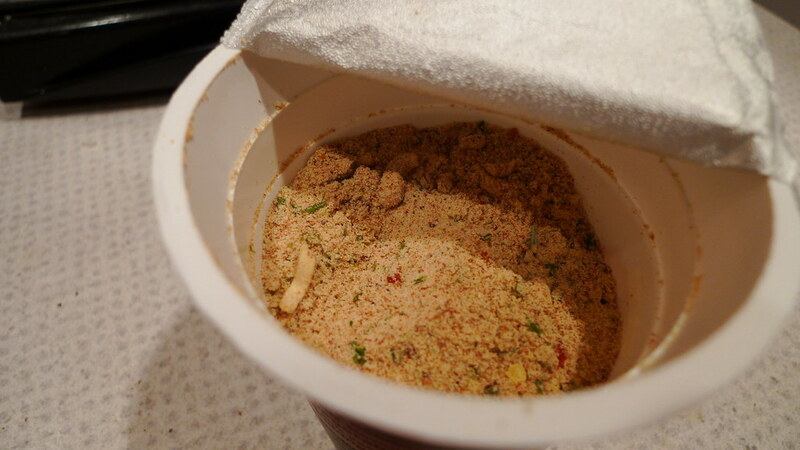 Now, unlike Chip Shop Curry, this one comes with a separate pouch with a wet seasoning mix inside. You do not add it until the end. I tried the noodles before and after the wet mix, but couldn't really tell much of a difference. 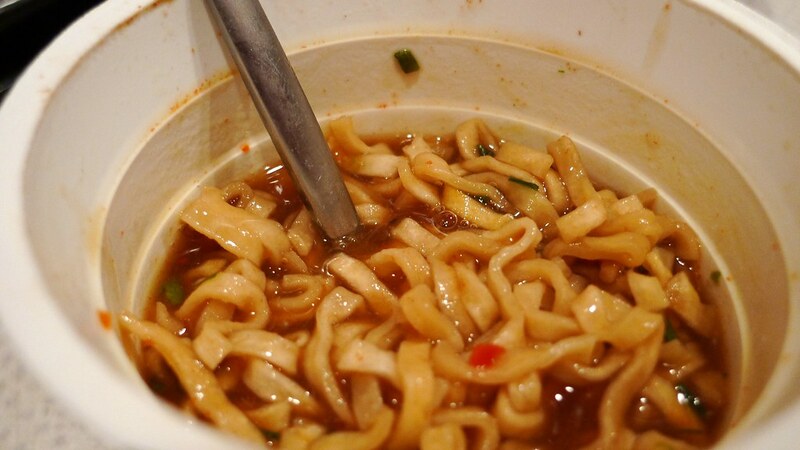 The broth is not very thick and I'm beginning to think that all of Pot Noodle's products are like this. Kind of interesting how the Americans eat it more as a soup. 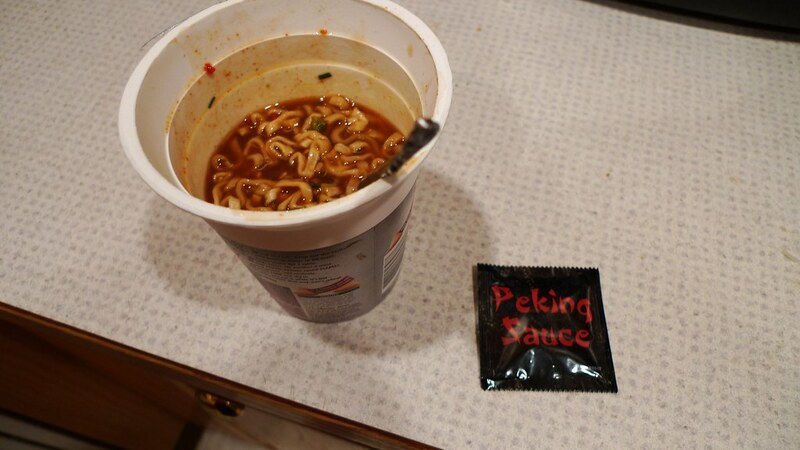 Adding the Peking Sauce. Not sure how this really improved the taste. My first bite of this noodle was amazing. It immediately took me back to the spare ribs my grandma makes. How did they steal her recipe!? Seriously though, the flavor is almost spot on! I would have loved to have thrown some of the meat that she makes in here and it would be my perfect meal. No joke. Here is what I think is going on in her mind in each frame: 1. "What is this odd concoction that you have placed before me?" 2. "It tastes kind of weird." 3. "I don't like it! I don't like it!" 4. "My give up." As you can tell, Juliana did not like this one at all. I don't really blame her because it's such a bold and different taste. It's really a shame because the flavors are fantastic. Good on Golden Wonder for making such an authentic product. Wish this one was available here. I would get it often. It's fairly low calorie and low sodium, too! Just had one of these, so delicious! Not to mention the awesome packaging that looks like it's straight out of Big Trouble In Little China. Think it's my new favourite PN.